The reality of life hit me hard while I was knee deep in the Douglaston Salmon Run in upstate New York. I had just released one of the biggest fish I had ever caught and was recomposing myself on the run. I looked back at the bank and down river and took in the sight of my friends, new and old, casting and chatting. Cigar smoke floated downstream and sounds of talking and salmon breaking through the surface of the water filled the soundscape. I took a deep breath and closed my eyes. I did it. I was there. I couldn't believe it. I'd be lying if I said some tears didn't well up behind my sunglasses. I had been flown across the country with my coworker and friend JG to attend the DSR Salmon Camp. Douglas Outdoors had so kindly invited and hosted us for a few days of fishing and socializing. I couldn't believe I was there. The first day had been hard, I don't do a lot of two-handed casting, and I was getting frustrated at myself and cursing God for not letting me catch fish. I recently read a quote from Lori Ann Murphy of Reel Women Fly Fishing that said: "Our cast demonstrates our soulful effort to reach for perfection." I have never felt so invested in a cast. I wanted nothing more in that moment than to feel the tug on the other end of my line. Finally, I ended up catching a few amazing fish (and God forgave me) and I wrote the day off as a success. That night was spent drinking too much whiskey and wine in wall tents with amazing people and food. We stayed up well into the next morning, telling stories and taking it all in. Fishermen are extravagant storytellers as many of us know, it's no wonder we clocked in around 10 hours of sleep the whole time we were there. The next day was the day that changed my life. I started catching fish and it seemed like I couldn't stop. I hooked into a big steelhead, a coho and many kings. I had the drift down, had the right fly and was simply in the right place at the right time. It was worth the 5 AM wake up call and the 3 hours of sleep. Every fish I caught filled me up with so much joy, appreciation, and wonderment. Fly fishing is one of those sports that inspire thoughts and emotions in me. Good or bad, each day I am on the water I walk away with some clarity or thoughts for life going forward. Fishing is about the relationship between you, the river, the fish and if you believe, Christ himself. I had never felt so confident and comfortable with where I was and where I was headed. It gave me a better sense of purpose and direction. The next year is going to be crazy as I try and finish my degree and step into the real world. This day made me feel like everything is and is going to be ok, great actually. The guides, especially Mike, were so helpful and honest with their advice. The energy was amazing on the river. You could hear whooping and cheering mixed with big slaps and splashes when fish were hooked. I don't think I have ever been happier. I was so grateful and amazed by the whole experience. That night was spent again in camp, Maker's Mark in hand, getting to know the other anglers. 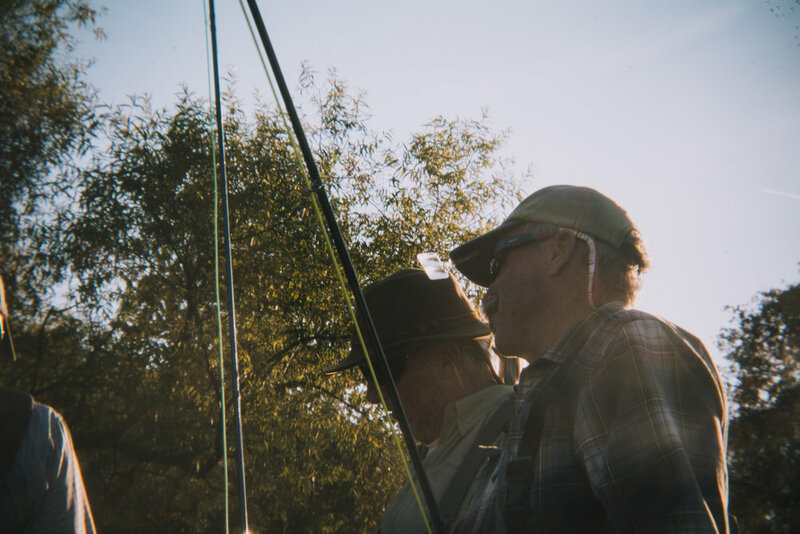 We came from all walks of life, diplomats, CEOs, guides, shop employees, photographers, and a college student, all gathered on the banks of that river to celebrate a love for fishing and what the river has to offer. After dinner, the Montana contingency showed our friends from the east how to play dizzy bat. Everyone gathered around to watch the spectacle, cheering and heckling every participant while polishing off a few dozen PBRs. Another late night followed by an early morning found us on the river, tired, hungover and sad with the reality that in a few hours we'd be flying back to the real world that awaits us at home. A hot and hectic stop in LaGuardia and uneventful flights spent sleeping brought us back home. Coming home has brought on a slew of thoughts and emotions, most of which I am not anywhere near done processing. But it gives me hope. I feel comforted in the direction my life is going, excited to see what happens next and hungry for the next tug.